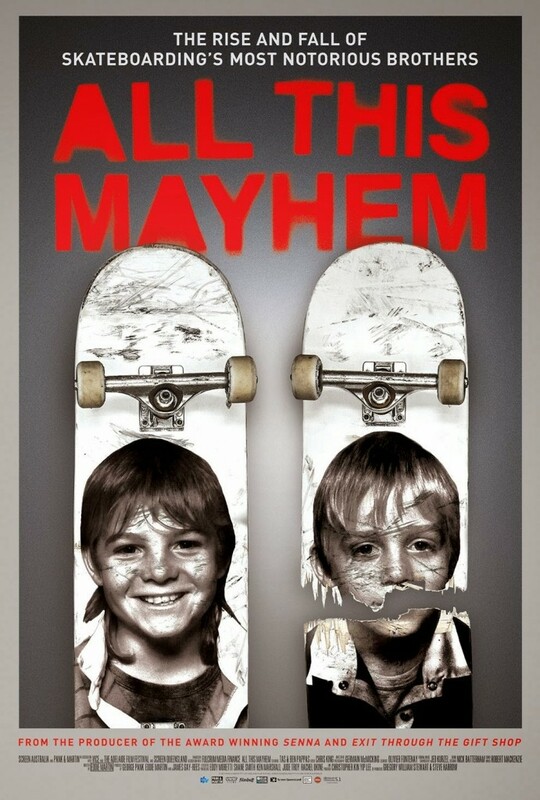 SUMMARY: All This Mayhem showcases the rise and fall of the world’s best skateboarders; two brothers from Australia who launch from the vert into the limelight only to come crashing down under the weight of their own fame. DETAILS: All This Mayhem is the most appropriate title this tragic documentary could have. It tells the story of the Pappas brothers (Tas and Ben) who grew up in Australia and started skateboarding as young kids. The motion of the skate ramp is very symbolic of the lives of Tas and Ben. Once they learned to ride the vert (half pipe) their careers and personal lives follow the same arc; fast motion, enormous energy, up the ramp, launch into the air, gravity kicks in, free falling back to the ramp… oh, and by the way, any error in timing the landing can and will be catastrophic. Soon after Tas and Ben learned to push the limits they took the skate world by storm and helped redefine the sport. As brothers, they went head to head with skate legend Tony Hawk… and they beat him, pushing the boundaries and creating new tricks every step of the way. But fame can lead to drugs, and drugs can lead to the downward spiral that would eventually wreck both Tas and Ben’s lives. Their tailspin includes arrests, drug abuse, physical abuse, and eventually murder, suicide, and prison. It’s a tragic story of two boys who couldn’t handle their own success. They had everything a skate kid could ask for… except the sense to handle it all.